As of late March 2018, the average risk-based capital (RBC) ratio of the Korean insurance industry fell by 8.0 percentage points to 249.9 percent compared to three months earlier. The available capital was down 2.6 percent, amounting to KRW 121.7 trillion, due to a decrease of KRW 4.4 trillion in mark-to-market gains on available for sale securities in the wake of interest rate increases. The yield on five-year Korea Treasury Bond rose to 2.43 percent at the end of March 2018 from 2.34 percent three months before. The required capital shrank marginally to KRW 48.7 trillion as the capital requirements for interest rate risk decreased amid rising interest rates. 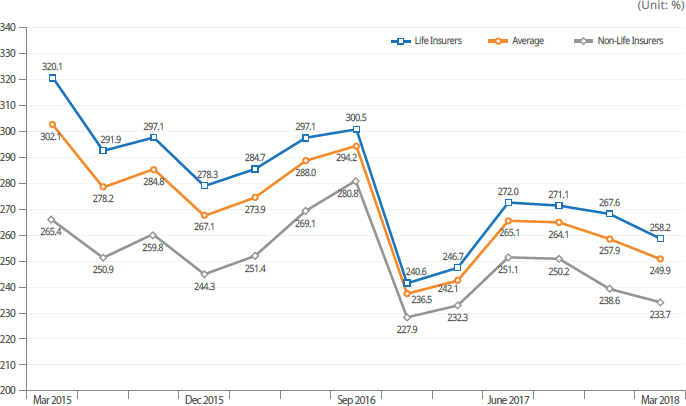 Life insurers saw their RBC ratio decrease by 9.4 percentage points to 258.2 percent, while the ratio of non-life insurers drop by 4.9 percentage points to 233.7 percent. The ratios remained far above the statutory minimum requirement of 100% under the Insurance Business Act.